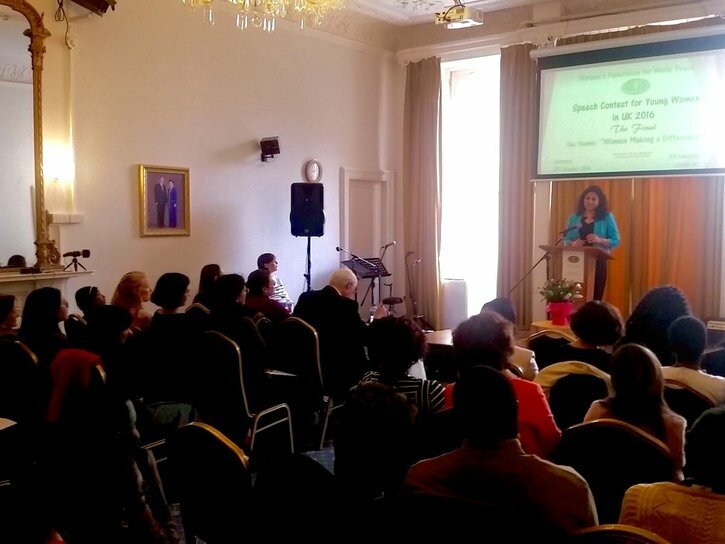 The contest aims to expand the federation’s educational activities by giving young women in the UK an opportunity to speak in public about their beliefs and life values. Alicia was one of only seven finalists from 30 applicants, following a three-round selection process. Each finalist presented for 8-10 minutes to an audience of over 60 people, ranging from participant’s family members to organisers of other Non-Governmental Organisations. […] Today I want to leave you with the message: that it is up to us to wake up every morning with motivation and clear sight of our dreams… success comes to those who work for it continuously, even when others do not. But I think, most importantly, I came here to tell you that I would like to see all of us making a difference and being remembered for it; not for being a WOMAN making a difference, but for being a HUMAN BEING who came into this life to “… to thrive; and to do so with some passion, some compassion, some humour, and some style” (Maya Angelou). Alicia received some fantastic feedback, including that her speech was memorable and served as motivation for audience members to pursue their goals. Congratulations to Alicia for this fantastic achievement!